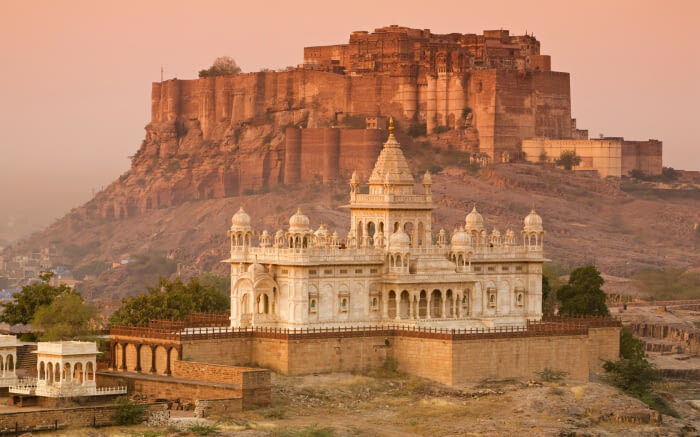 Jodhpur Day Tour is starting from Jodhpur where you will see the Mehrangarh Fort, Jaswant Thada, Rao Jodha Desert Park. The Duration of this tour is approx 8 to 9 hours and distance may be approx 70 to 80 KM. Jodhpur Day Tour Start from Jodhpur Tour starts at 9: am and come back at Jodhpur office on 5:PM we start our tour From Jodhpur Fort. Mehrangarh, known for its beautiful architecture, formidable walls, and cultural heritage, is one of the most magnificent forts in Rajasthan, India. There is no exaggeration in Rudyard Kipling describing the fort as “Amazing Palace of India Rajasthan that might have been built by Titans and colored by the morning sun”. One of the most interesting places to visit in Jodhpur is the Rao Jodha Desert Rock Park , named after the king who built Mehrangarh Fort, and also Jodhpur. Unlike any of the other attractions in Jodhpur, which have well seeped into the history and Rajasthan's culture, the Rao Jodha Desert Rock Park is a unique attraction one must visit. Situated in a large area near the famous Mehrangarh fort, the park is an ecologically restored zone hoping to restore the desert ecology that once existed in the area and died out over the years. The project began in 2006 and after five years of clearing out the plant that had killed most of the diverse ecology and subsequently growing the plants that now thrive here, this park was opened for visitors in 2011.
established in 1897 by Lt. Fatohji ,who remain as a source of inspiration to be dedicated to work. Presently the organization is handling and owning by the Mr. Usman Gani. Since the last one century Salawas Durry Udhyog has been manufacturing and supplying all kind of durries with good quality. Jodhpur Day Tour Finished at Jaswant Thada and Drive back to Jodhpur city and Drop at Hotel and Airport. Car Rental in Jodhpur offer best price to rent a cab or taxi in Jodhpur. Car rental Show the reliable services to the customer. taxi services are useful for the travelers who wants only pickups and drops facility means transfer from one Jodhpur place to another like airport pickups and drops, railway station pickups and drops, bus stand pickups and drops and hotels pickups and drops.